In the modern age, an age that has become digital, a business trying to compete without a digital marketing strategy is like trying to complete a Rubik’s Cube just using your teeth: it can be done, but will take a long time, and is exceptionally difficult. A digital marketing strategy gives you the fingers and thumbs of Feliks Zemdegs. 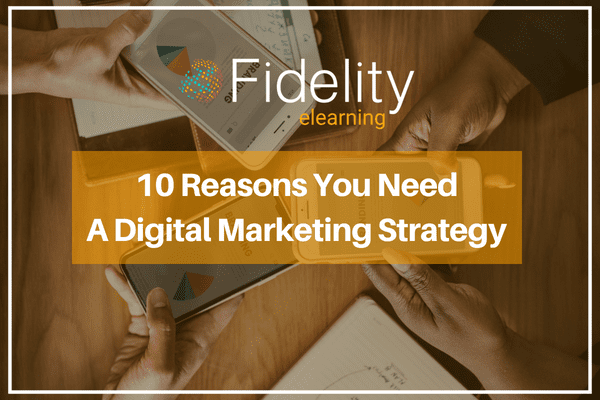 Fidelity eLearning brings you 10 reasons why you need to implement a digital marketing strategy. Your target audience is your key set of customers, the people who you ideally would like to walk through your doors (or go onto your website), and ultimately purchase your product. For any start-up, defining and getting to know your target audience is the best way to figure out what products they would like, and which features can be added to provide the best customer satisfaction – which is always good for your brand. Everything about digital marketing tells us that optimisation is the be all and end all, and to be honest, at this kind of level, it is. That goes right from optimising your webpages and content for search engines, all the way down to the technology you invest in to drive your marketing efforts. For example, mobile devices are now used more often than desktops to carry out product searches and make online purchases – have you optimised your content for mobile and desktop? If not, you need to start! Production costs, banners, advertising costs in prime spots on billboards; they all cost a lot of money, a lot more than participating in social media and creating your own website to share via your networks – which can be done free. You can reach more people for less with digital marketing and it is much easier to share your work, simply with the click on a button! Any business can compete with any competitor with a solid digital marketing strategy. In days gone by, the larger companies would get bigger as their revenue would dictate that they can spend more on marketing, with the smaller businesses struggling to match the fittings of bigger competitors. With digital marketing, good user experience, from the content and ease of navigation of your website to the quality of your service and product will shine through. This one is a bit of an unfair factor. Traditional marketing can deliver conversions, but you will most likely reach less people, and how will you measure the impact of your marketing efforts? Analytics provide you with accurate measurements of conversion, impressions, clicks and more ratios than a GCSE Maths paper. These will help you to determine what’s working and what isn’t. Think of the biggest brands you know: Apple, Nike, Amazon. They all started as small businesses but built a brand that is instantly recognisable. Apple were six weeks from folding and Amazon used to only sell books before becoming the eCommerce giant you see before you today. Building a brand reputation and image is important for any business. A reputation of customer satisfaction can be portrayed with crisp user experience, good reviews and a relevant solution to their need. We have already alluded to this in reason number three, but digital marketing will provide you with better return on your marketing investment through a combination of everything suggested thus far. Optimising your content for your target audience, pinpoint your target audience’s demographic and utilise the tools at your disposal to showcase your organisation. The best digital marketing strategies should act as a rudder or compass (or satnav if you want to get digital) to your business. They will provide direction in how you want your product and company to be portrayed in front of your audience and the link between the two entities. Your strategy will involve mapping out the company’s direction over the foreseeable future giving you a clear goal, so make sure you can achieve a sustainable competitive advantage, while keeping your customers satisfied. With digital marketing, it’s a lot easier to reach more of your customers at once. This can be achieved through email, social media, mobile applications, push notifications, almost anything that comes with the joy of owning a smartphone that can be accessed on demand. We are connected to the internet all the time. The number of mobile phone users worldwide is expected to pass the five billion mark by 2019; these are all people that you can reach instantly and utilise your activities to reduce the number of customer defections through customer loyalty and brand loyalty initiatives. Resources are many things: your employees, your budget, the technologies you use and the way you use them. Digital marketing will help you to make better use of these resources into a more efficient and cohesive unit. A combination of the right digital marketing strategy, a tight but effectively used budget, the understanding of key digital marketing practices and useful tools can see your profits soar. Fidelity eLearning offers digital marketing courses for people at any stage of their digital marketing career. So, if you’re just starting out, or you’re a marketing professional trying to update your skillset, click here to see how Fidelity eLearning can help you with accredited, industry-recognised qualifications.